I'm delighted to announce that 'Legacy of the Ripper', the sequel to A Study in Red - The Secret Journal of Jack the Ripper was today released in its e-book edition by Double Dragon Publishing and is available from http://www.double-dragon-ebooks.com/single.php?ISBN=1-55404-689-0 The paperback edition will follow soon. I received a wonderful message from a lady called Darlene Campbell on Outsider Writers yesterday. Darlene is from Kentucky but has roots in the Aztec Culture and her words moved and touched me deeply. I'm so grateful that my book could engender such feelings. She has given me her permission to reproduce her words here, and this is what she had to say. I'd like to ask for your votes my friends. 'Of Aztecs and Conquistadors' written by my alter ego Juan Pablo Jalisco and with a superb cover design by Graeme S Houston, has been nominated for this month's New Covey Cover Award. I'd really appreciate it if my friends would visit http://thenewcoveycoverawards.blogspot.com/ vote for the entry at #6, 'Of Aztecs and Conquistadors'. 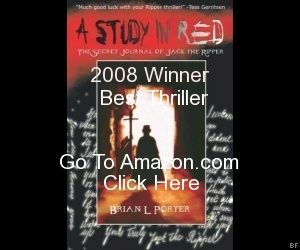 I'm over the moon that the video trailer for 'A Study in Red - The Secret Journal of Jack the Ripper' has won The New Covey 'Most Intriguing' Trailer Award for April 2009. I must thank Graeme Houston for his excellent work in producing the video on behalf of Thunderball Films, and can't really say much more other than that I really am delighted with this latest accolade for the book.